Hua Hua is a radical indicating vegetation. It is composed of a horizontal line, with two smaller vertical lines crossing it. The horizontal line is the surface from which the plant emerges. In the case of the lotus, that surface is swampy water. The two vertical lines are contractions of a primitive that was an offering made with both hands. It is now construed as the plant itself emerging from the ground. Chuan Chuan in its primitive form is a yoke, meaning mastery. It is now a carriage. The carriage delivers riches, medicine, and honored persons. It is a treasure vehicle. Cho Cho is footprints, one after the other. It looks like a large "Z" with two dots above it. 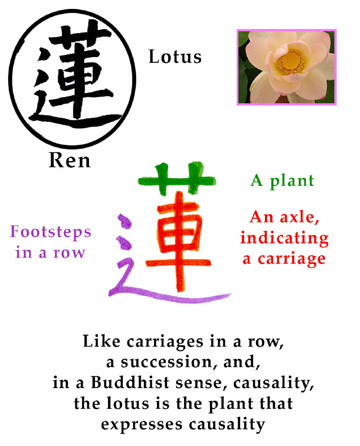 Click here for a full-size printable version of the explanation of Ren (at left).